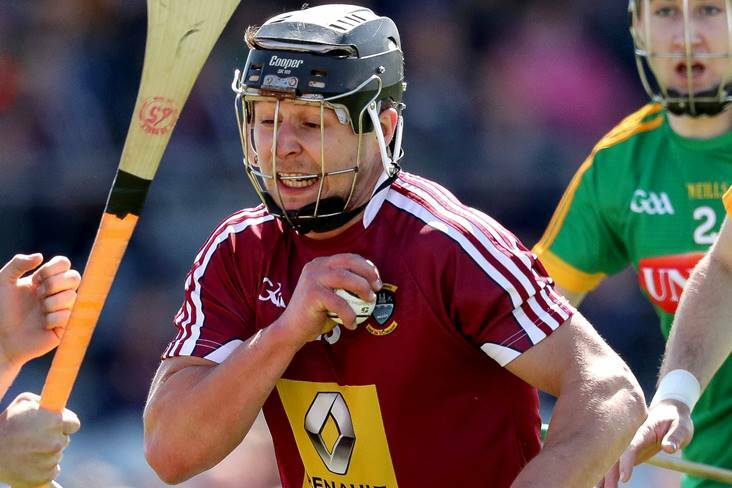 Westmeath, Meath and Kerry opened their Allianz Hurling League Division 2A campaigns with wins over Carlow, Kildare and London respectively. Robbie Greville was outstanding as Westmeath avenged last year's first round loss to Carlow with a 0-19 to 0-15 victory at Netwatch Cullen Park. The visitors had Aaron Craig sent off in the first half, but still went into the break on level terms, 0-8 each. Carlow were also reduced to 14 men after the restart and trailed by two points before they had a goal controversially disallowed with three minutes remaining. Following that let-off, Michael Ryan's charges grabbed the last two points to seal an important win. In Newbridge, Jack Regan fired 1-10 as Meath defeated neighbours Kildare by 1-16 to 0-16. Kerry's Shane Nolan. ©INPHO/Tom Beary. Meanwhile, Shane Nolan and Jordan Conway were to the fore as Kerry ran out emphatic 2-30 to 1-13 winners over London in Ruislip. Westmeath - P Carroll; S Power, T Doyle, L Varley; A Craig, P Greville, C Boyle; E Price, D McNicholas (0-2); J Gilligan, N Mitchell (0-2), S Clavin; A Devine (0-7, 5f, 1'65), K Doyle (0-4), R Greville (0-3). Subs: G Greville for E Price, N O'Brien for S Clavin, D Egerton for J Gilligan, C Doyle (0-1) for D McNicholas. Carlow - B Tracey; D Wall, A Corcoran, M Doyle; E Nolan, D English, R Kelly; J Murphy, D Byrne; S Murphy (0-3), M Kavanagh (0-1), E Byrne; D Murphy (0-8, 7f), K McDonald, C Nolan (0-3). Subs: J Doyle for K McDonald, J Kavanagh for J Murphy, C Foley for D Byrne. Meath - S McGann; K Keoghan, D Healy, C Lynch; D Kelly, J Keena, N Weir; J Toher (0-2), A Forde; P Conneely (0-2), C O Mealoid, J Kelly (0-1); N Heffernan, A Gannon, J Regan (1-10, 1-0pen, 0-6f, 0-1'65). Subs: E Marsh for N Weir, E O Donnchadha for N Heffernan, S Quigley (0-1) for A Gannon, C McCabe for C O Mealoid. Kildare - P McKenna; C Forde, J Doran, P Sullivan; E O'Neill (0-1), M Moloney, M Grace; P Divilly (0-1), N O Muineachain; J Burke (0-9, 8f), R Ryan (0-2, 1f), J Sheridan (0-1); B Byrne, M Fitzgerald (0-2), C Bonus. Subs: P Dermody for P McKenna, B Deay for R Ryan, K Whelan for C Bonus. Kerry - S Murphy; J Buckley, B Murphy, S Weir; J O'Connor, D Collins (0-2), T Murnane; D Griffin (0-1), B Barrett (0-1); P Kelly (0-1), S Nolan (0-11, 10f), D O'Carroll (0-3); P Boyle (1-3), C Harty (0-3), J Conway (1-2). Subs: J Goulding (0-1) for B Barrett, R Horgan for B Murphy, P Lucid (0-1) for P Kelly, P O'Connor (0-1) for S Nolan, M O'Connor for C Harty. London - J Barrett; C Hickey, B Regan (0-1), W Campion; D Moore, K Reid (0-1f), C McAlinden (0-1); A O'Leary (0-2), S Conlon (0-1); O Sheil, R Murphy (0-5, 4f), T Clarke; C Lordan, M Duggan (1-1), J Troy. Subs: D Roberts (0-1) for S Conlon, D Nolan for J Troy, S Skelly for O Sheil, D O'Regan for W Campion, A Griffiths for T Clarke.